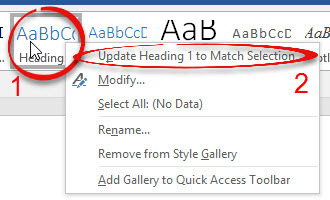 If you have used a style several times in a document, whether it's a built-in Microsoft style or one you have created, you can easily change it and then all the places in your document where it has been applied will automatically change. This process also works in Word 2013. Select a paragraph, text or other object that is formatted with the style you wish to change. The example uses Heading 1 style. Step 2: Change the selected object's formatting. The example changes the color, font and font size. Step 3: With the text, paragraph or object still selected, right click on the style that is highlighted in the gallery. Click Update Heading 1 to Match Selection. Step 4: Any text or paragraph that has Heading 1 style applied is automatically changed to the updated version.